There are many things we love about my brother-in-law, Bradley. He is kind, funny, good at mediating family arguments, and most importantly, he loves my sister. But perhaps the best fringe benefit of having a brother-in-law from Baton Rouge is that he brought boudin into our lives. And for that, we will forever be grateful. 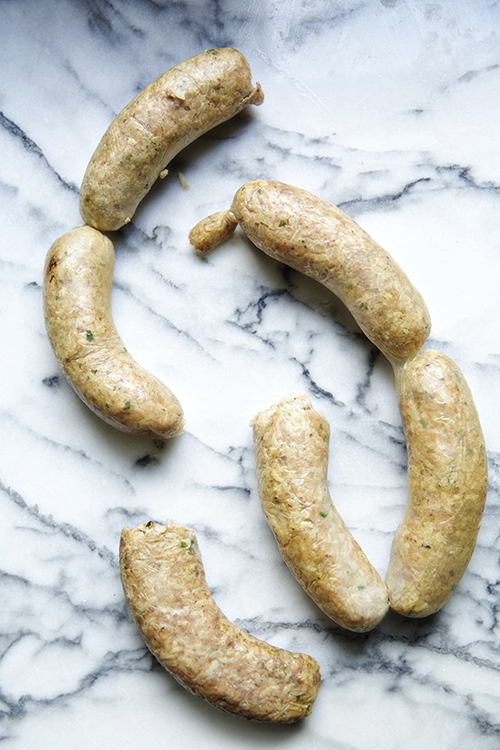 Boudin (pronounced bou-dahn) is a Louisiana specialty, a Cajun tradition that adapts the French boudin blanc to what was readily available in the Acadian settlements. Cajun boudin is pork liver, ground pork shoulder, rice, parsley, green bell peppers, onions and spices all cooked, mixed together, and stuffed in casing. The cased boudin is then grilled or smoked and served with hot sauce, making it irresistibly delicious. 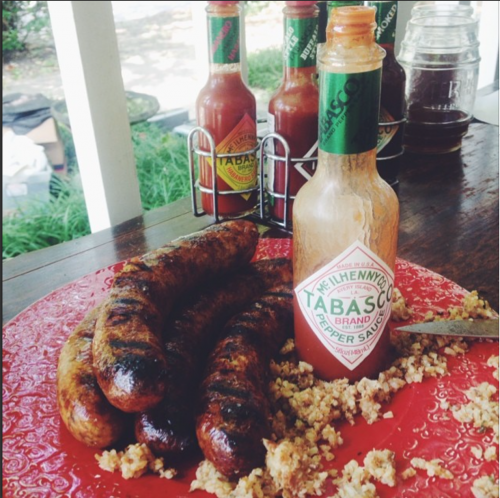 Bradley and Lauren bring boudin with them every time they visit, which meant that by the time I visited Avery Island, Louisiana, a few years ago with Tabasco I knew to be first in line every time boudin was served. One of the highlights of that trip for me was our visit to a local boucherie called Legnon’s to watch them making boudin. The process was incredible, I’m still in awe by how quickly those women were able to stuff and segment those sausages! 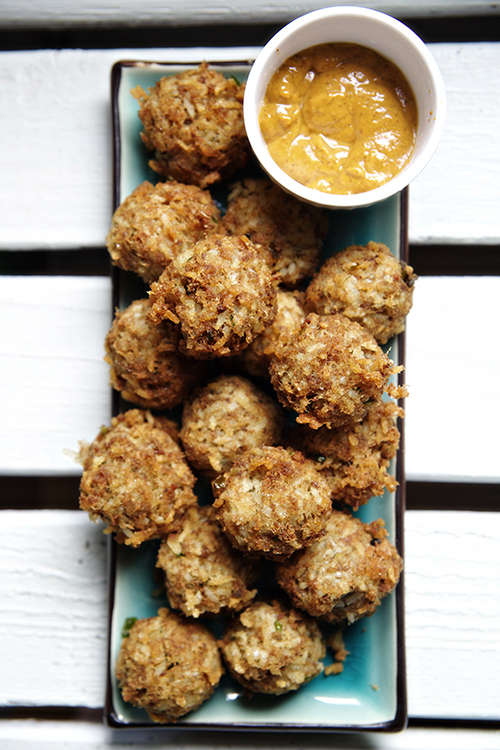 We made a batch of boudin for Dan’s big birthday party a few weeks ago, and after we’d exhausted all the casing available we fried the remaining filling into boudin balls and served them with a spicy chipotle mustard. We smoked the boudin links and squirreled away a few in the freezer, which I will be cooking up this week in celebration of Mardi Gras. That, and the beignet dough I’ve been saving! Heat high-temp oil to 375F. 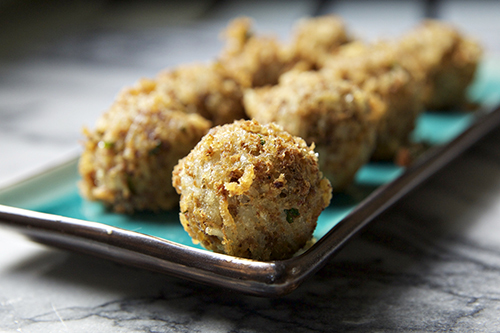 Use your hands to pack the boudin into balls approximately the same size as golf balls. Fry for 3-4 minutes or until golden brown. Serve hot, with spicy mustard or hot sauce to dip. 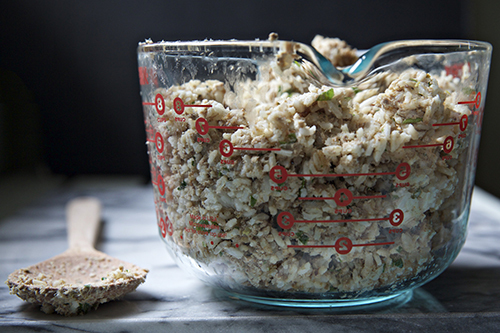 What a fun idea, I’ve never attempted boudin. Love cajun food, so must give this a try! I love deep fried rice balls… I’ve been big into fried kimchi balls and arrancini lately, but I feel like boudins are the original fried rice ball ;) tasty! I’ve never tried boudin before – I think I’ve been missing out! I love boudin. We have a festival here in Texas each May that has crawfish and boudin, and I look forward to it again this year. Maybe it’s time for me to start trying to make my own! Looks fantastic! I LOVE boudin. However, I never knew it had liver in it. I am torn between trying to forget I ever heard that and wondering if I would be brave enough to try making it–despite my lifelong hatred of liver lol. And it is not an organ meat thing–I am cool with organs, just not liver LOL. But I was always forced to try it plain. And I do love boudin…. Love these balls too! Hah! I am touchy about liver too (not that you’d realize that by the past few recipes I’ve posted) but once it’s through the grinder it’s invisible. You’d just have to turn a blind eye for that part! is this similar in taste to boudin cheese? I love meatballs so I’m going to have to try this one, I love all of your suggestions! So glad I found your website! It’s hard to find a good southern food blog that isn’t just semi-homecooking. I’m excited to try some of your recipes! I’m so glad you found me! Thanks for the sweet words, I work hard to stay far away from the semi-homemade trap! These boudin balls absolutely something new for me! Looks yummy! I’m also gonna pin this post on my Pinterest board my followers will love it. Thx for sharing recipe, i definitely add it to my cookbook! 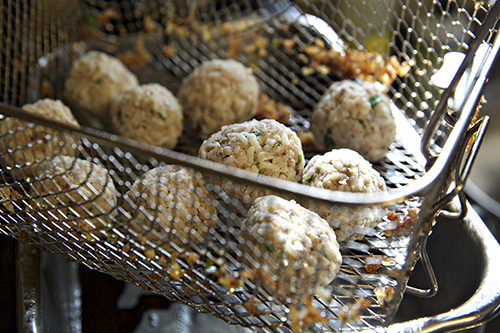 This is absolutely magnificent, scrumptious, delicious, super yummy boudin balls. Thx for sharing recipe, I definitely add it to my cookbook!